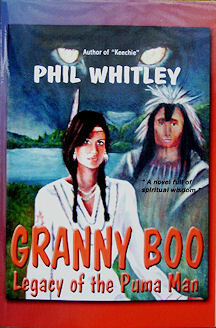 Granny Boo is the long-awaited sequel to Phil Whitley's first novel, 'Keechie'. I've been involved in this project personally - Phil asked me to create a painting for the book cover - and I was delighted when he, and his publisher, accepted the artwork that resulted. I really enjoyed his first novel, and have been looking forward to this second instalment for years. I'm very pleased to report that 'Granny Boo' is as good as 'Keechie'. 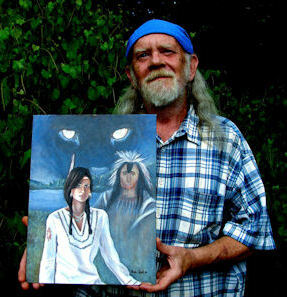 Whitley combines a very realistic, and often tragic history of Native American Indians in 19th Century Georgia, with a touching and poignant tale of survival in a post-apocalyptic U.S.The country has succumbed to various terrorist atrocities that have destroyed the infrastructure holding civilisation together. In the resulting power vacuum, the West has once again become Wild. Brian and his family seek refuge in a secretly located cave, once inhabited by a Native American Indian woman decades before whom Brian had got to know very well in his youth, (the story related in 'Keechie'). The family must rely upon the survival skills he has acquired and remain hidden until the troubles die down. They become extremely wary of strangers, and with good reason.